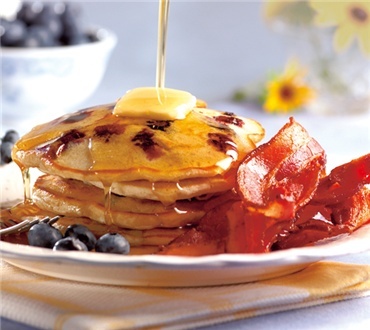 Bomb your pancakes with wild blueberries for a magnificent taste experience!! Note: one tin is needed per batch. I like these blueberries to add to muffins-they are the perfect size. Really good. I love these little tins of awesome blueberry flavor! The size is just perfect to add to a batch of pancakes or muffins. The wild berry is much better to add to cake-like recipes as it doesn't weigh down batters like a larger blueberry. The flavor is also more intense. I often add one tin to my batters and thicken another tin for a yummy sauce. I like to stock up on these and use them all year. These wild blueberries pack a huge punch of flavor for such a little berry. I use them in my lemon cupcakes and cake and always receive rave reviews. I would be remiss if I were to ever switch to any other wild berry.